To Cite: Ekici Y, Moray G. Laparoscopic Mesh Repair of Giant Morgagni-Larrey Hernia With Three Ports: A Case Report, J Minim Invasive Surg Sci. 2015 ; 4(3):e30212. doi: 10.17795/minsurgery-30212. Introduction: A bilateral anterior parasternal hernia is commonly called a Morgagni-Larrey hernia. Morgagni hernias are rare in adults, accounting for 3% of all treated diaphragmatic hernias. This article reports a giant bilateral Morgagni-Larrey hernia, repaired with a laparoscopic reduced-port technique. Case Presentation: An 83-year-old female was admitted to the general surgery outpatient clinic with gastrointestinal, respiratory symptoms, and retrosternal pain. A computed tomography (CT) scan showed a 12-cm retrosternal hernia defect on the right and a 3-cm defect on the left of the diaphragm The stomach and colon were herniated from the right defect and the omentum was herniated from the left defect to the thorax. The hernia contents were pushed back to the abdomen and the defects were repaired with single sutures through a three-port laparoscopic procedure. A composite mesh material was placed and fixed with pro-tack (Covidien). The patient was discharged on the fourth postoperative day without any complaints. Conclusions: Transabdominal laparoscopic Morgagni-Larrey hernia repairs with reduced number of ports are safe and feasible. A number of diaphragm’s weak points at birth can later form hernias. A Morgagni-Larrey hernia (MLH), presenting in senile patients, mainly occurs as an anterior defect of the right and left sides of the diaphragm. The Morgagni region is defined on both sides of the xiphoid bone between the diaphragmatic muscle attachments to the xiphoid process and seventh costal cartilage (1). A congenital diaphragmatic hernia is seen in 1/2000 - 3000 live births (1). The incidence of Morgagni hernia is over 2% of all congenital diaphragmatic hernias and MLHs are very rare (1). Patients may represent respiratory and gastrointestinal symptoms (1). There are different types of repair techniques for Morgagni hernia. There is still debate about the best surgical procedure. In this case report, we present a giant MLH, repaired by laparoscopy with a reduced-port technique. An 83-year-old female was admitted to the general surgery outpatient clinic with intermittent nausea and vomiting episodes starting since three months ago. She had complaints of chronic constipation, bloating, dyspnea, and chest pain and no history of abdominal or other types of operation. She had a mild hypertension, treated with calcium channel blockers. Her family history was unremarkable. During the physical examination, there were normal bowel sounds with a non-tender, loose abdomen with no palpable hernias. She had mild scoliosis. Her laboratory tests showed mild anemia with a hemoglobin serum level of 11.2 gr/dL and a hematocrit level of 34.4%. Her blood tests were all within normal ranges and her body mass index was 21 kg/m2. An upper gastrointestinal endoscopic examination revealed pangastritis with chronic inflammation of the duodenum without any specific pathology. The computed tomography (CT) scan of the thorax, abdomen, and pelvis with intravenous (IV) and oral contrast showed bilateral hernias of the Morgagni spaces. The size of the right and left defects were 12 × 8 cm2 and 3 × 3 cm2, respectively. The patient was placed in the reverse Trendelenburg position on the operating bed under general anesthesia. The abdominal area was created with a pressure of 12 mmHg by insufflating carbon dioxide with a Veress needle through the infra-umbilical region. Three operating ports were then placed before starting the operation. First of all, a 10-mm trocar was inserted from the infra-umbilical site. Two 5-mm (right and left subcostal sides) trocars were placed symmetrically on the paramedian line at the subcostal level. A 30-degree, 10-mm camera was used for visualization. After abdominal exploration, two defects were defined at both sides of the diaphragmatic parasternal area. The right parasternal defect was bigger than the one on the left side and the stomach and colon were on the right and the omentum on the left (Figure 1). After abdominal exploration, the herniated organs were taken back into the abdomen. The abdominal pressure was decreased to 8 mmHg and both hernia sacs were dissected with LigaSure (Covidien) from the thoracic region. The defects were repaired with a simple interrupted technique, using 2/0 Ethibond (Ethicon) sutures (Figure 2). 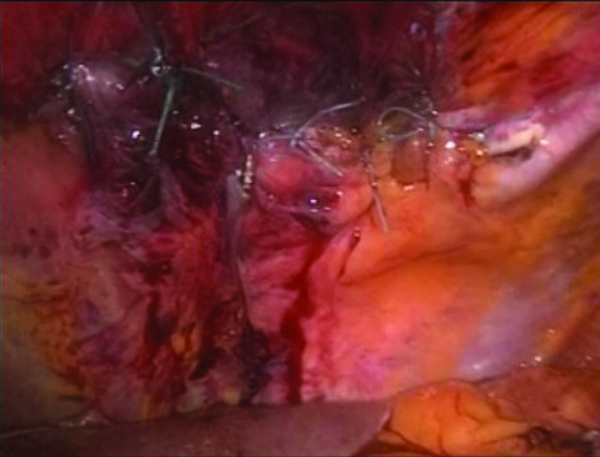 A tension-free mesh repair technique was performed: The hernia defects were patched with tailored composite polypropylene mesh of 15 × 20 cm2 (Covidien) fixed with pro-tack (Covidien). The operation lasted for 105 minutes. The patient was discharged on the fourth postoperative day without any complications. Two weeks after the operation, she returned to normal daily activity. She was symptom-free and had no complications during the three year follow-up period. Morgagni-Larrey hernias are rare diaphragmatic defects. Morgagni hernias, seen in patients of older ages, are mostly acquired. The weak points on both the parasternal sites of the diaphragm are filled with fat and the superior epigastric artery and vein pass through this space (2). Diaphragmatic hernias, enlarging with age, start from these weak points under positive pressure of the abdomen and negative pressure of the thorax. The average age of a patient diagnosed with a Morgagni hernia is 53 years old (2). Factors increasing intra-abdominal pressure like pregnancy, obesity, and trauma may initiate Morgagni hernia formation. This patient had no history of trauma, was not obese, and had three pregnancies. A right-sided parasternal diaphragmatic hernia is more commonly seen than bilateral hernias (1). There was a huge diaphragmatic hernia on the right and a smaller one on the left side in this case. The stomach, colon, liver, small intestine, and omentum are the commonly reported herniated organs (1). Adult patients with Morgagni-Larrey hernias are often asymptomatic or have non-specific symptoms. The presenting symptoms generally originate from the gastrointestinal and respiratory systems, which may vary according to the size of the hernia defect and the hernia content (2). Gastric volvulus and colonic strangulation are reported as acute surgical emergencies (3, 4). The diagnosis of MLH may be difficult, as it is a rare condition and has a wide range of symptoms. Differential diagnosis consists of thoracic disorders, such as mediastinal lymphoma, mediastinal masses, or pericardial cysts; diaphragmatic disorders, such as fat pads, event rations, hiatal hernias, traumatic rupture, or neoplasms; and abdominal disorders including right hepatic lobe shrinkage (5). An accurate diagnosis of MLH is important in order to make the right treatment choice. A Morgagni-Larrey hernia diagnosis can be made by an abdominal or chest X-ray and upper gastrointestinal series. CT scan is the preferred method for an accurate diagnosis (6). Many authors advocate surgical repair for this type of hernia, even if they are asymptomatic (2). The main reasons behind the indication for an operation are the expected complication risks, including incarceration or strangulation of hernia contents. This indication may be true for children and young patients. But older asymptomatic patients with a high The American Society of Anesthesiologists Physical (ASA) status, who are at high risk for surgical and anesthetic trauma may be subject to a close follow-up. There are four main types of repair techniques: 1) open thoracic repair; 2) laparoscopic thoracic repair; 3) open abdominal repair; and 4) laparoscopic abdominal repair. Open thoracic repair is the traditional treatment for patients with MLH. Although open thoracic repair is reported to have favorable results, thoracotomy and single-lung ventilation are the major disadvantages of this technique (7). Thoracoscopic MLH repair is as effective as the open repair technique with lower postoperative pain, shorter hospital stay, and lower morbidity rate (8). The thoracoscopic technique requires a minithoracotomy (3 - 5 cm) and two or three port placements (8). Single lung ventilation and a limited work area are the disadvantages of this technique. Moreover, it is difficult to expose both sides of the diaphragm, compared to the abdominal approaches. Laparotomy has some advantages, when compared to the thoracic repairs, as stated above. Laparoscopic abdominal repair offers different advantages, including less pain than the above-mentioned three approaches: it avoids single lung ventilation; provides a large abdominal work space; and extremely good visualization of both the diaphragm and the abdominal organs (2). Smaller incisions in laparoscopy cause less complications, such as incisional hernias and wound infection. A hernia sac is generally present, but may occasionally be absent (9). Traumatic Morgagni hernias do not often have a sac. Some authors advocate removing the sac and others do not. The sac is excised preferably, if it can be dissected away from the mediastinal structures easily (2). When the hernia sac is adhered to the surrounding tissues in the thoracic cavity, the excision may be quite difficult and hazardous. The advantage of excising the hernia sac is to avoid a potentially empty space left behind in the thoracic cavity. The mesothelium-lined sac may cause fluid collection in these circumstances. It is more of a necessity to remove the sac when it is bigger. The issue of mesh repair is still controversial. Some authors do not recommend mesh repair, especially for small-sized hernias (2). We believe that primary repair is more prone to recurrence, according to the size of the defect, tension of the suture line, and patient’s age. The diaphragm continuously moves with every breath and stretches repetitively while coughing, sneezing, and laughing. There is no adequate data against the use of mesh repair of MLH. With recent advances in laparoscopic approaches, an experienced laparoscopic surgery team can safely and effectively repair MLH in such an octogenarian patient. We preferred to excise the hernia sacs in this case, because there was no adhesions to the surrounding tissues. The primary suture repair of diaphragm can fail the operation and allows the patient to return to her daily life. There are, however, not enough data in the literature for the gold standard treatment method for repairing the morgagni hernias. The choice of surgery basically depends on the patients’ conditions. Further studies on laparoscopy will show the role of laparoscopic repair among other repair techniques. Authors’ Contributions: Study concept and design: Yahya Ekici. Analysis and interpretation of data: Gokhan Moray.